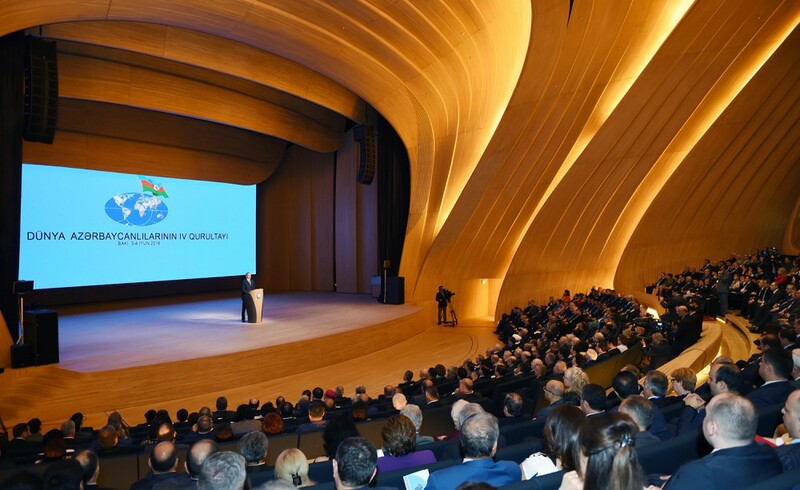 The fourth Congress of World Azerbaijanis has kicked off at the Heydar Aliyev Center in Baku. Azerbaijan’s President Ilham Aliyev attended the opening ceremony of the congress, Azertac reported. The head of state addressed the event. More than 500 diaspora delegates from 49 countries are attending the congress. The participants also include prominent foreign politicians, public figures, scientists, officials and parliamentarians, who have a friendly attitude toward Azerbaijan. A 360-man delegation comprising representatives of Azerbaijan`s state and government bodies, non-governmental organizations, scientific, educational, culture institutions, and political parties. After the official opening ceremony the congress featured panel meetings. The congress will feature meetings between diaspora representatives and heads of Azerbaijani state and government bodies, and they will discuss the government’s role in solving the problems facing Azerbaijanis abroad.